“When sitting in a lecture one day, Sarah came and spoke to us about volunteering with either the political archives or the art collection. What really appealed to me was how much she said it could help to build up our CV’s. Yet, I got a lot more out of volunteering with the political archives than just that. I helped out with the Jack McConnell papers within the Political Archives. When we first started, we were tasked with helping to organise two roomfuls of crates of his papers from throughout his career into categories. 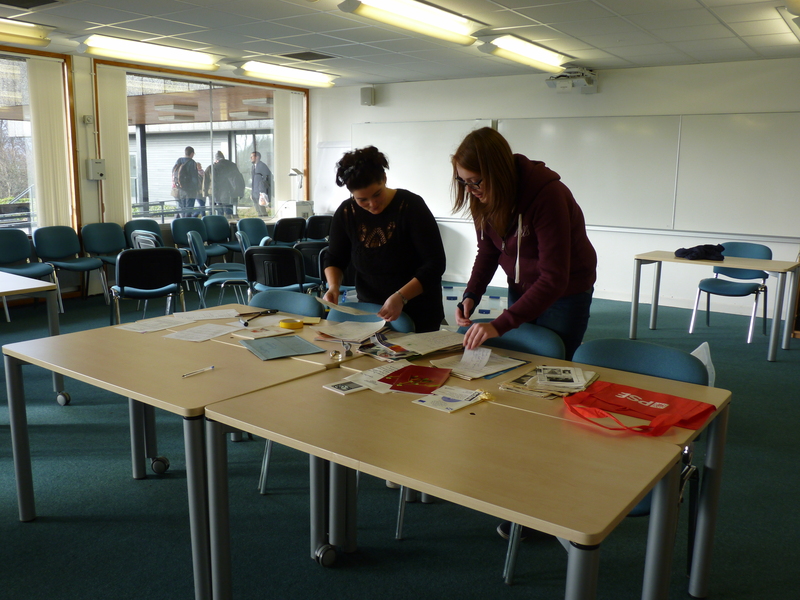 At first it felt very daunting, however Sarah soon put us all at ease and the other volunteers were great too, it ended up being a really enjoyable atmosphere, and many happy afternoons were spent sorting through the papers in a cottage within the university. Furthermore, the papers themselves were really interesting and I found myself learning more and more about the inner workings of his political career which could be riveting at times too. There was material, for example, from the run up to the opening of the Scottish Parliament and election and campaign materials and documents from his time as First Minister. The thing I loved most however was the hours spent cataloguing the papers. This may sound strange, but because of the interest factor of the material it was absorbing and exciting to be holding and reading things which formed a part of both historically and politically significant moments. The thing I especially loved though was the feeling that in the future, or the present for that matter, these materials would be extremely valuable. The feeling that we were contributing to providing an archive of materials of extreme political and historical significance just made it all feel very worthwhile. SPA’s archivist Sarah will be speaking about the archive and how we are collecting archive material for the referendum this Friday at the next Creative Stirling Pecha Kucha event. This is an open event and all are welcome. This Saturday marks 35 years since the 1979 devolution referendum. Here are two campaign leaflets from the archive. 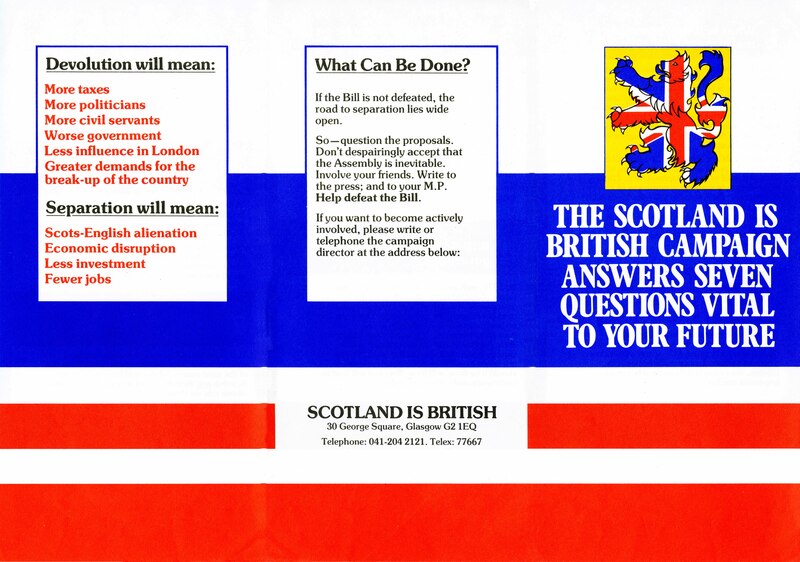 The No leaflet was issued by Scotland is British. Scotland is British was formed in late 1976 to campaign against the Scotland and Wales Bill. The group’s leaders comprised of journalist Adam Fergusson, former Labour MP George Lawson and trade unionist Archie Birt. The group aimed to garner support from MPs and other leading opponents to the Bill. Many leading members of this group also campaigned under Labour Votes No and Scotland Says No. The Yes leaflet was published by Yes for Scotland. 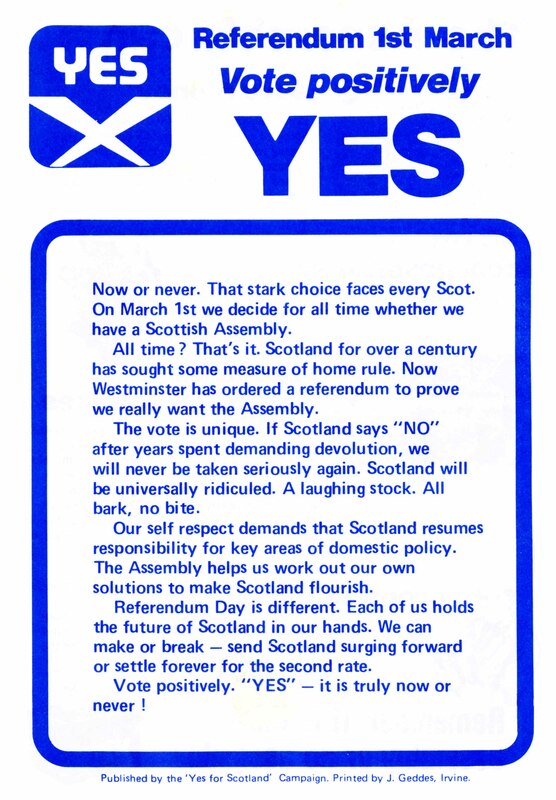 The Yes for Scotland campaign was launched on 26th January 1978. This group was chaired by Lord Kilbrandon, the author of the Royal Commission on the Constitution, 1973. The campaign was originally intended to be a cross-party group. However, the Labour Party declined to be involved in this group, preferring to campaign alone under the banner of Labour Movement Yes. The group consisted of politicians (most notably Jim Sillars), members of the church and cultural figures. However, the non-cooperation of the Labour Party effectively ensured that Yes for Scotland was not seen as the umbrella group it had originally been intended to be. 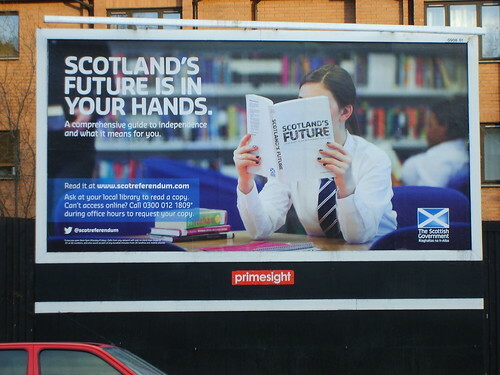 Billboard advertising publication of Scotland’s Future white paper, Stirling, December 2013, originally uploaded by Scottish Political Archive. SPA and the University of Stirling archives and special collections have been awarded a grant from the National Cataloguing Grants Scheme to catalogue the papers of Lord McConnell of Glenscorrodale. The McConnell collection spans the period from 1979 to the present day and contains material from his time as President of the University of Stirling right through to the present day. The collection includes papers relating to Lord McConnell’s time as First Minister (2001 – 2007). Managed by The National Archives, the grants programme helps archives to catalogue previously inaccessible collections. The programme is funded by a collective of charitable trusts and foundations including the Pilgrim Trust, the Foyle Foundation, the Wolfson Foundation and for the first time this year, the Andrew W Mellon Foundation. 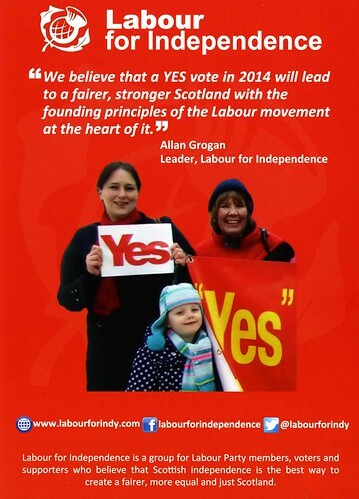 Labour for Independence leaflet, September 2013, originally uploaded by Scottish Political Archive. Labour for independence are “a political organisation which supports a “YES” vote in the Scottish independence referendum. We are working within the Labour party to promote the benefits that independence would bring to the people of Scotland”. This item was collected at the 2013 March and Rally for Independence. 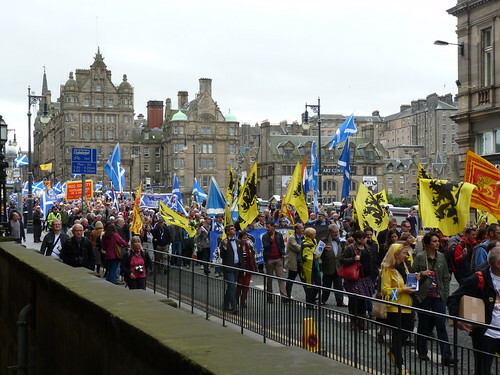 The second March and Rally for Scottish Independence was held on the 21st September 2013. Supporters of a yes vote in the 2014 referendum rallied in the High Street on the Royal Mile in Edinburgh for midday and then marched to Calton Hill via North Bridge and Princes Street. At Calton Hill they held a rally where they were addressed by speakers such as Alex Salmond, Nicola Sturgeon, Dennis Canavan, Alan Grogan, Blair Jenkins, Hardeep Singh Koli and Elaine C. Smith. March and Rally for Scottish Independence, September 2013, originally uploaded by Scottish Political Archive. 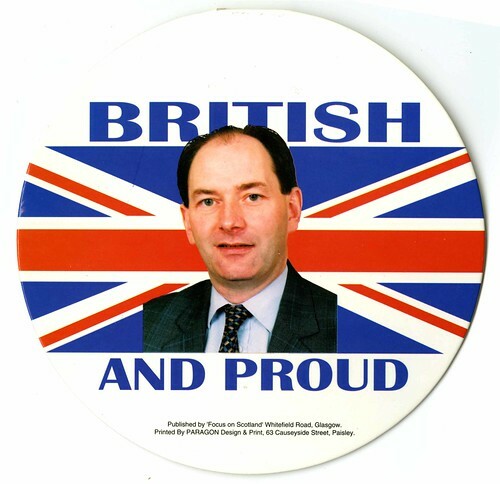 Campaign badge, c.1997, originally uploaded by Scottish Political Archive. 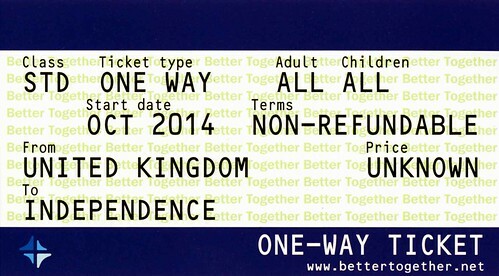 Better Together One Way Ticket, August 2013, originally uploaded by Scottish Political Archive. Independence One way ticket. Non-refundable. Price Unknown issued by Better Together. Better Together were the No campaign group for the 2014 referendum. 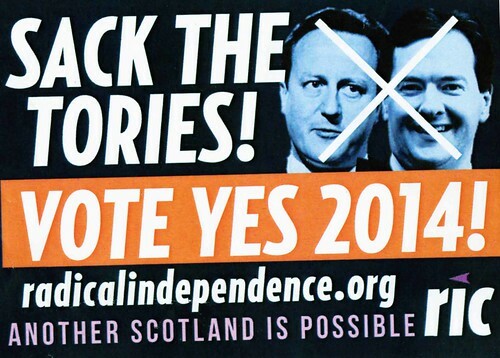 Radical Independence sticker, August 2013, originally uploaded by Scottish Political Archive. This sticker was collected at the Radical Independence bus on 17th August 2013. Radical Independence campaigners met the bus at the City Chambers in Glasgow before traveling to various venues around the city to hand out leaflets and hold street meetings. Radical Independence are a group of activists, intellectuals, and representatives from across the progressive movement who have united in support of Scottish independence in advance of the 2014 independence referendum.